A recent interview on the Radio Prague website with the Czech-Japanese film director, Haruna Honcoop, caught my attention and got me thinking again about one of my favorite architectural debates in Central & Eastern Europe: what to do with buildings built during the Communist era? Should they be knocked down and forgotten or preserved as icons of a painful yet real piece of history? The interview concerned Honcoop’s new film, "Built to Last." In the discussion, she makes what I think is a convincing case for preserving the buildings based on their originality and unique expression of prevailing political and architectural trends. 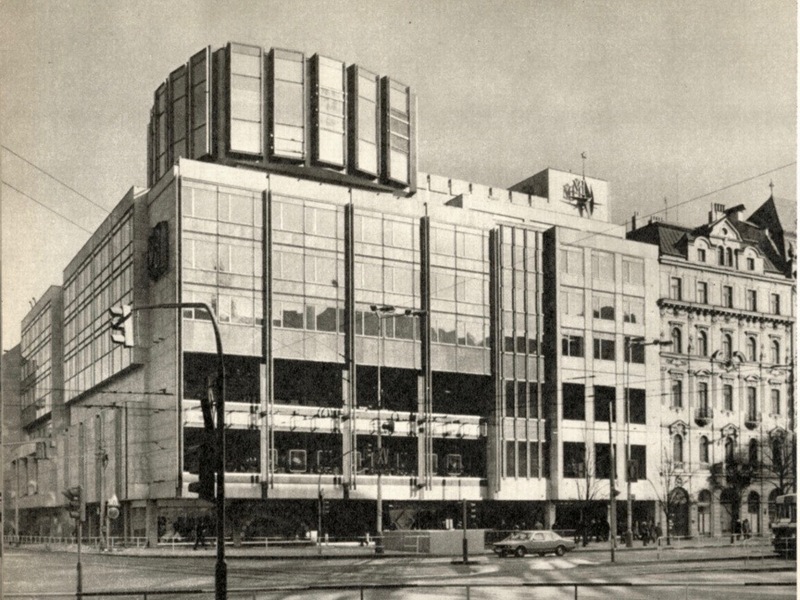 A few years ago, I wrote a similar story for the Berlin-based publication "Hidden Europe" in which I focused on a local Czech debate at the time over what to do with two iconic Prague department stores that both date from the 1970s. The stores are still standing and the debate ongoing. Top Photo: Save it or knock it down? 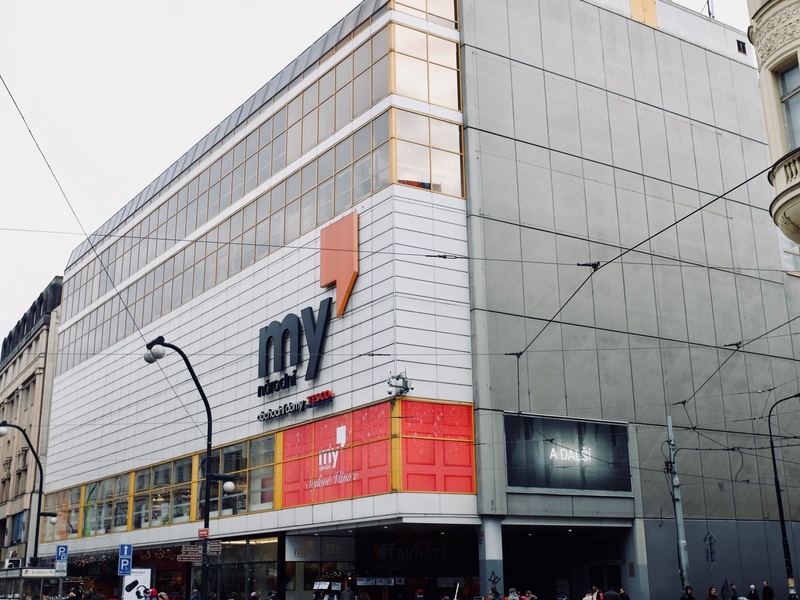 The windowless sides of the 1970s' Kotva Department Store seem an odd choice from today's design perspective, where natural light is a key feature. Photo by Mark Baker. Posted in Diversions, Life In Prague and tagged 1970s, Architecture, brutalism, communism, Czech, Czechoslovakia, history, kotva, modern, Prague, retro. The Kotva Department Store as it appeared in November 2017, covered with Christmas decorations but looking similar to its original appearance in the mid-1970s. Photo by Mark Baker. 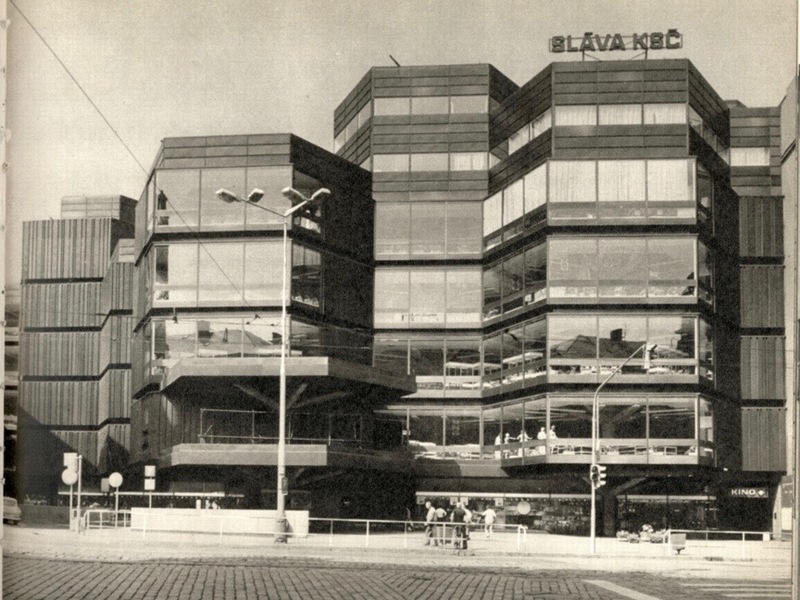 File photo of the 'Brutalist'-style Kotva Department Store, shortly after opening sometime in the 1970s. A wider-angle view of Kotva's intentionally drab, metal-sheathed facade, with the more traditional Neoclassical style of the surrounding buildings in the backdrop. Photo by Mark Baker. Kotva's interiors are stuffed with hexagonal supports that mimic the building's external appearance as stacks of cubes. One downside: they limit sight lines. Photo by Mark Baker. 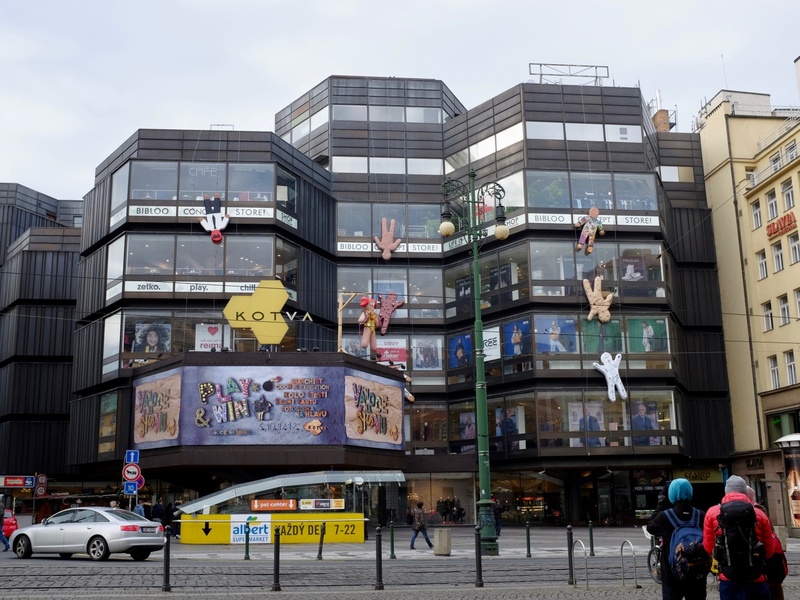 Prague’s Kotva Department Store may be the ugliest building ever built in the Czech Republic. It dates from the mid-1970s and was designed by the Czech architectural duo Věra Machoninová and Vladimir Machonin. 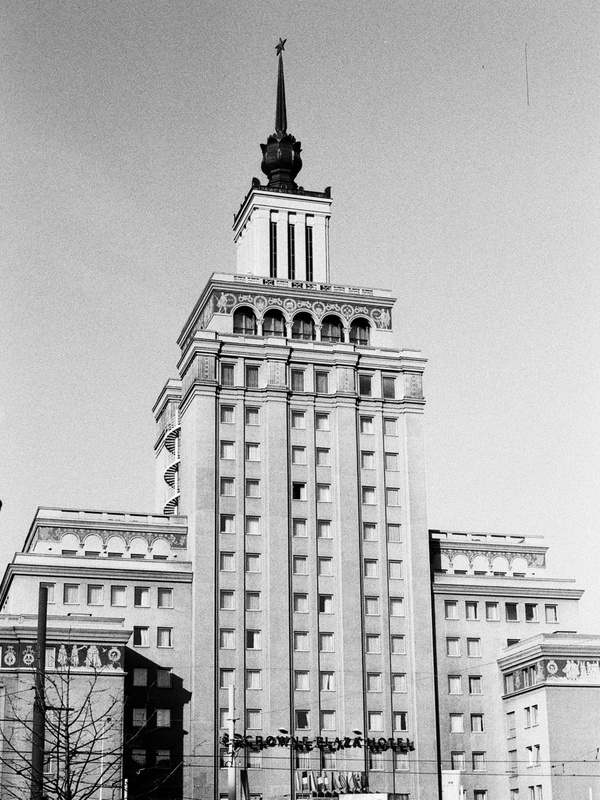 The building was hailed at the time of its construction as a local variant of “Brutalism” – then the reigning international architectural style – while meeting the specific ideological demands of Communism. Start with the exterior: It’s a hulking, dark-brown box, windowless on several sides. The façade, on close inspection, looks to be made of some type of corrugated sheet metal. The shape of the building is defined as a series of interlocking hexagons. The intention was probably to lend an innocent touch – like children playing with cubes or building blocks – but these hexagons are unsettlingly oversized. The effect is more aggressive than playful. What’s more, the building’s peculiar shape creates little indentations, particularly at the back, which at night morph into hideaways for occasional petty crime and illicit drug use. After midnight, the property’s back and side areas are pretty much no-go zones. Things are not much better on the inside. While the interior has been given a thorough makeover from Communist times, the space still feels cramped. The hexagons limit sight lines (not practical for a department store), and what could be a smoothly flowing floorplan is broken up by a series of small kiosks. 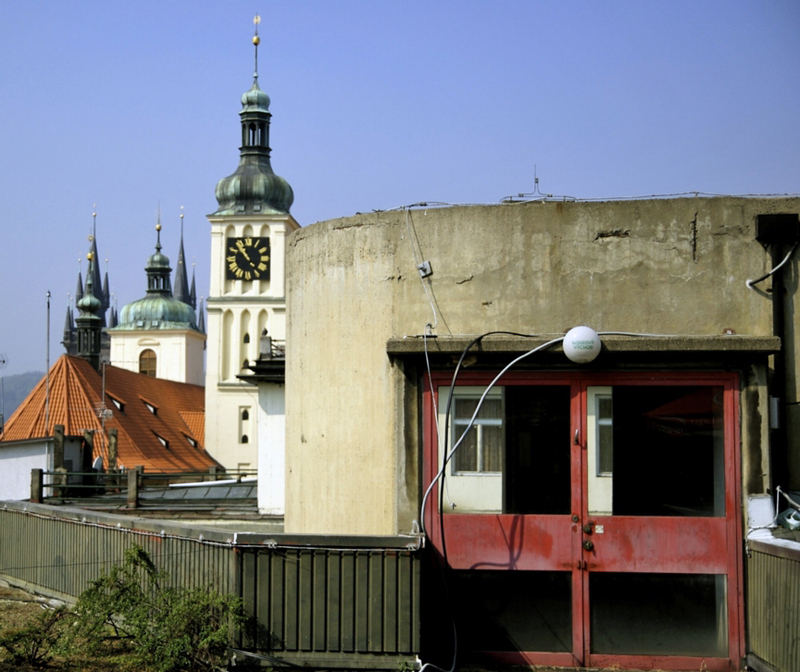 From nearly any point of view – functional or aesthetic – Kotva arguably should be knocked down and its valuable real estate, on the edge of Prague’s Old Town (see map plot, below), given over to some other use. And yet, despite its flaws, there’s something undeniably alluring about Kotva; something that still animates its fans (and incenses its critics). It’s hard to put a finger on, but a visit here feels in some way like a trip through time – back to a pre-Velvet Revolution Prague when life was arguably bleaker, but also simpler and more manageable. Kotva is a kind of corrugated-metal mnemonic device, capable of triggering all manner of memory – good and bad – of life under Communism. 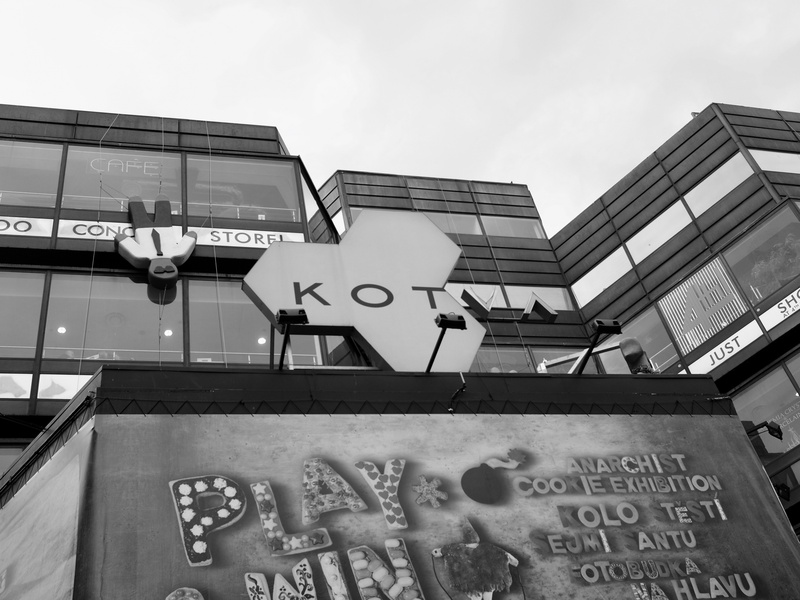 It’s probably no surprise that Kotva and another department store from the same era, Máj (Tesco), find themselves at the center of an ongoing debate over whether to preserve buildings that were built during the Communist period. On its face, that debate appears to be about architecture, but in fact it has more to do with memory. Is it better to remember Communism or forget it ever happened? The Kotva Department Store has both its passionate defenders and detractors. I personally prefer it to shopping in the fancier mall across the street. Photo by Mark Baker. The intentional chunked concrete of Kotva's 'Brutalist' style contrasts with a touch of Prague's more lyric Baroque in the backdrop. Photo by Mark Baker. The front and side views of the Máj (Tesco or "My") Department Store. The appearance of a factory or warehouse was intentional and the building won several awards in the '70s. Photo by Mark Baker. The architects apparently modeled the Máj, at least partly, on the Centre Pompidou in Paris, though you’d have to look pretty hard to see any real resemblance. Photo by Mark Baker. 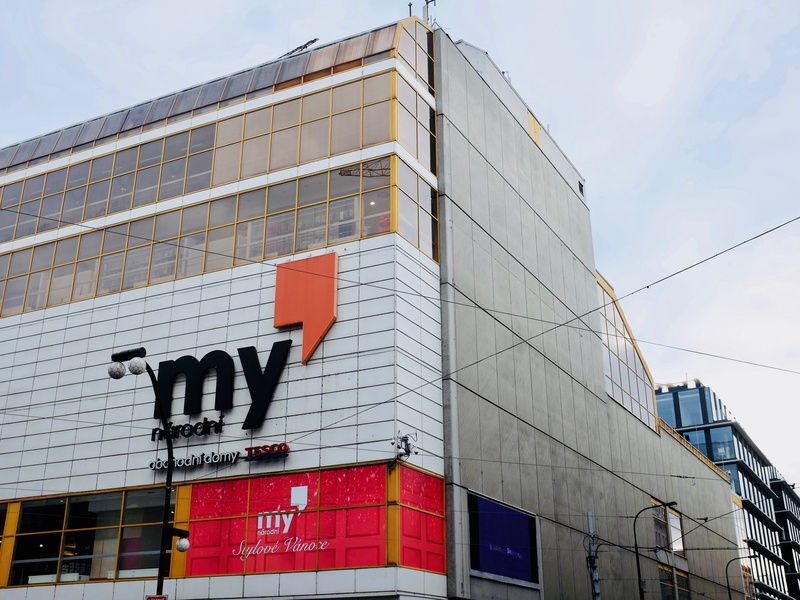 The "Máj" (Tesco or "My") department store, Like Kotva, was built in the mid-1970s and might very well find itself someday on a “World’s Greatest Carbuncles” list. The store occupies a prominent position on the city’s Národní třída (National Blvd) and followed an early design of the noted Czech architect Martin Rajniš, working together with John Eisler and Miroslav Masák. The architects apparently modeled Máj, at least partly, on the Centre Georges Pompidou in Paris, though you’d have to look pretty hard to see any real resemblance. Perched on a busy corner of a main artery, the store – now wearing the ill-fitting “Tesco” label of its current owner – looks like an ordinary glass and metal box. The faded-yellow metal stripping around the windows leaves a dated or retro feel, depending on your point of view. The building’s architectural claim to fame is an exposed bank of escalators below a glass canopy at the back. 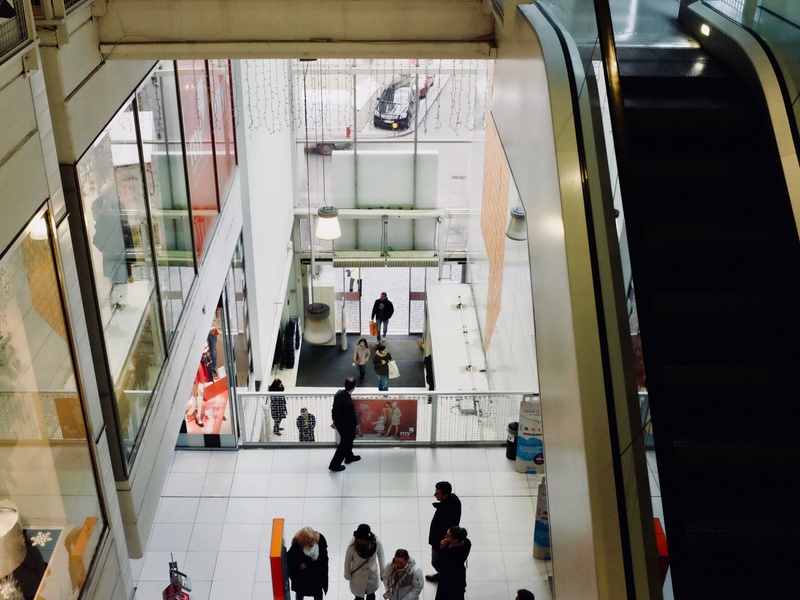 That’s the kind of architectural flourish that helped win design prizes in the 1970s, but the location of the escalators is actually an inconvenience to shoppers, who must exit the store to move from floor to floor. Efforts to protect the two buildings have been led, at least in part, by a controversial local critic, Rostislav Švácha. Švácha has been accused by some of being too sympathetic to Communist-era design. He’s even come out, on occasion, in favor of the pre-fab housing projects (paneláky in Czech) that ring every major city in the country. Many other consider them simply eyesores. Švácha’s views may be debatable, but his perspective makes some sense. The 1960s saw an enormous building boom in schools, hospitals, hotels, and shopping centers, and by no means are all of these buildings bad. If there was a heyday for Communist-era architecture, it was during this time, the decade following the influential Expo ‘58 world fair, held in Brussels. 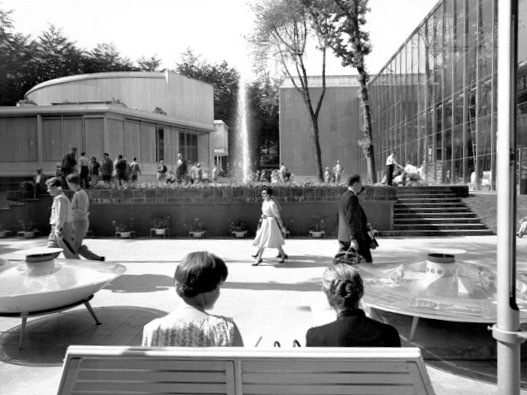 There, the stylish Czechoslovak pavilion won unprecedented international acclaim. This catalyzed a new generation of architects to move away from the stifling Stalinist “wedding cake” and Social-Realist styles that were in vogue immediately following the end of World War II. The best of these buildings from the 1960s incorporate the same arty, winsome elements that made the Czechoslovak pavilion at the Brussels ’58 world fair so alluring in the first place: a retro-futuristic, Sputnik-inspired modernism that looks as if it came straight out of a Jetsons' cartoon. By now, many of these buildings are falling apart. They languish, caught up in a general debate over their architectural merits. They could use the kind of financial support and attention that historic preservation would bring. 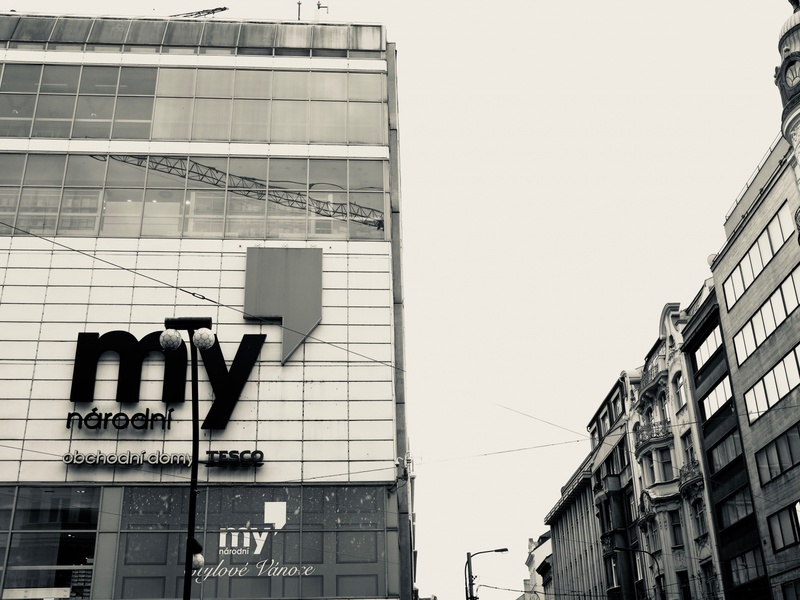 Those opposed to the architectural preservation – including for a time Tesco’s management, which had hoped to demolish its Máj property to build a new store – argue the buildings are badly designed and ill-suited to modern needs. Couched in the argument, for many, is a deep rejection of the Communist experience as a whole, something the vast majority of people here would no doubt like to forget. Zdeněk Lukeš, the chief architect at Prague Castle when I spoke to him a few years ago researching my original story, is caught somewhere in the middle. He’s had the unfortunate task of weighing the various claims of a building’s architectural merits and then rendering an informed opinion. Lukeš has tried to be detached. His criteria for evaluating Communist buildings are the same as for other periods: originality, creativity, and how a building works in practice. He supports efforts to recognize Kotva and Máj – despite their flaws -- as historic buildings. He points out that Máj, for example, was one of the most important buildings of its day. 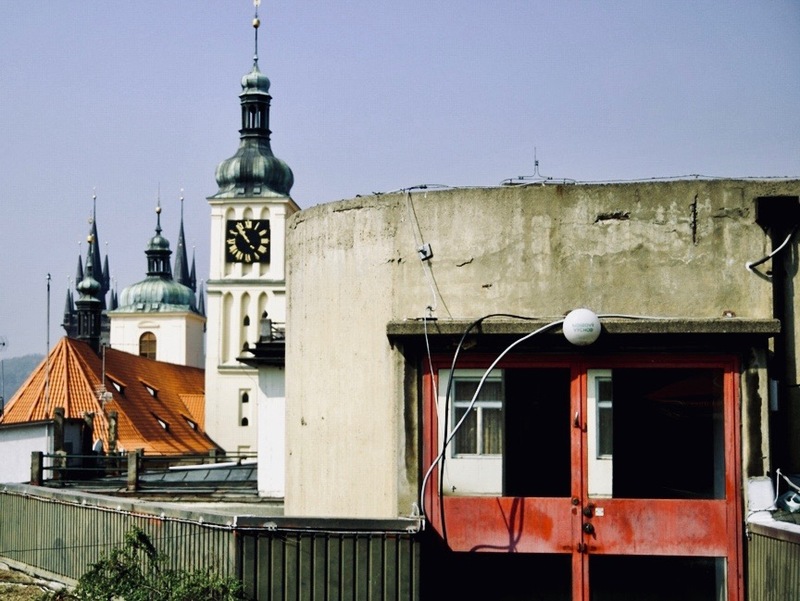 He’s less charitable, though, about many of the other buildings built during the Communist period, particularly those from the 1970s and ‘80s after the 1968 Warsaw Pact invasion, a time he calls the worst for design in modern Czech history. 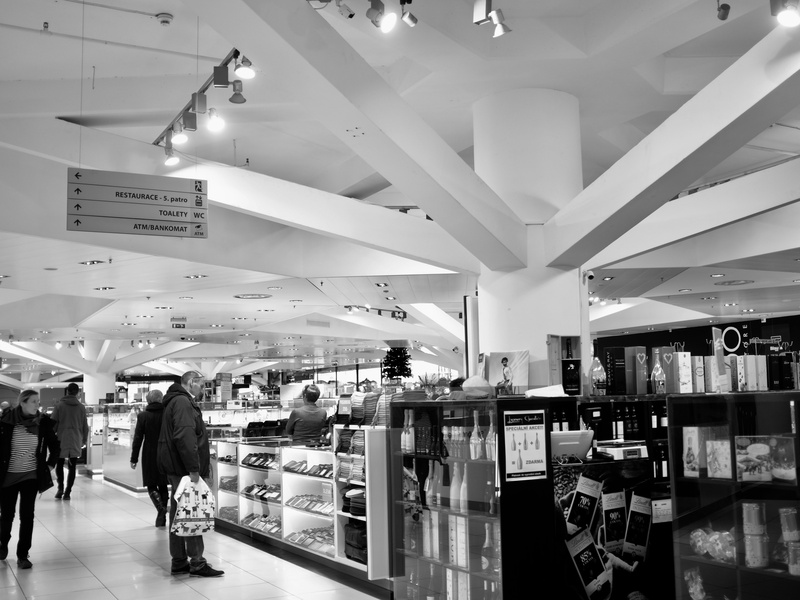 The clean, featureless front of the Tesco Department Store occupies one of Prague's most prominent commercial corners. Photo by Mark Baker. 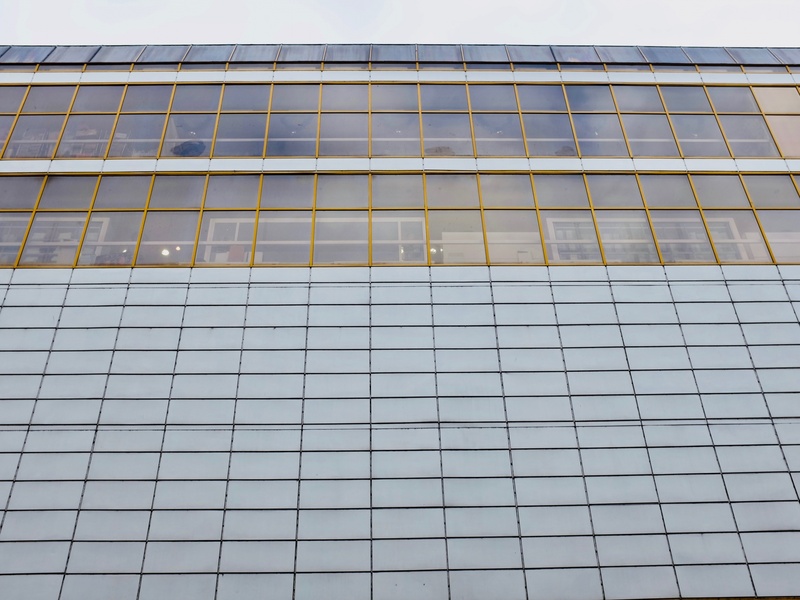 The front facade of the Tesco Department Store is a modern, faceless grid, relieved only by the use of yellow striping toward the top of the building. Photo by Mark Baker. 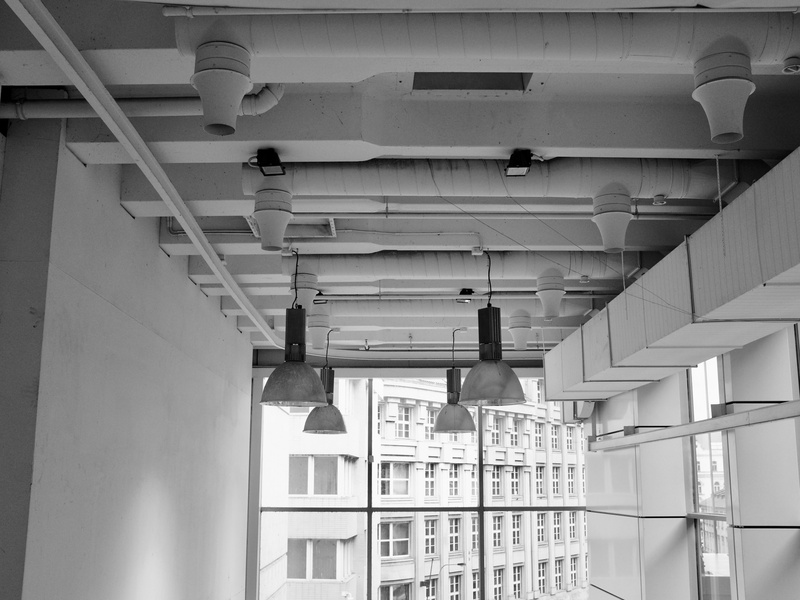 Tesco's ceiling intentionally shows off the building's wires, ducts, and piping in keeping with the Brutalist aesthetic of revealing a structure's inner integrity. Photo by Mark Baker. The building’s claim to fame in the 1970s was an exposed bank of escalators (right) at the back of the store. The location, though, is actually an inconvenience to shoppers, who must "exit" the store to move from floor to floor. Photo by Mark Baker. Architecture is taken quite seriously in the Czech capital. 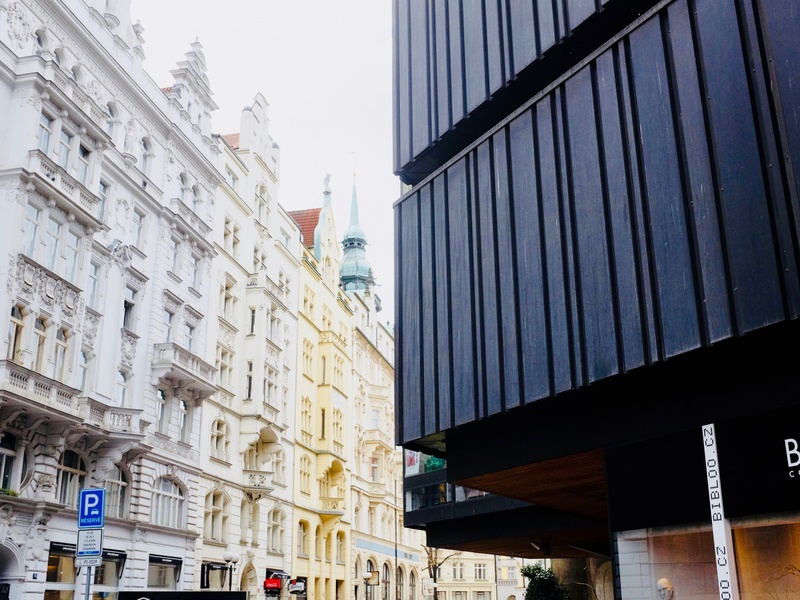 Indeed, it’s no stretch to say that architecture is the lifeblood of Prague. A stroll through Prague feels like a graduate course in architectural history. The Gothic spires of the oldest buildings yield, a block away, to a more mannered Renaissance and then to the rounded, colorful Baroque, before breaking out into Rococo farce. The 19th century brought with it decades of bland but handsome Neoclassical, erupting in another design frenzy that came at the turn of that century: Art Nouveau. There’s even a sprinkling of early-20th century Cubism, Czech National Revival, and finally the stripped-down, arty Functionalism of the interwar years. The beauty of these buildings draws millions of people here every year. The question for many, now, is whether the Communist period was simply another storied evolution, or a glitch in the model. It must be admitted it’s unlikely that Kotva or Máj will ever compete for attention with the Charles Bridge or the dramatic twin-spired Týn Church that rises behind Old Town Square. But there may be that odd tourist, someday, who’d like to experience a taste of what life was like in the bad old days from 1948 to 1989. And for him or her, at least for now, we know just where they should shop. (This article first appeared in print in issue no 15 of ‘Hidden Europe’. Find a link to the original story here). 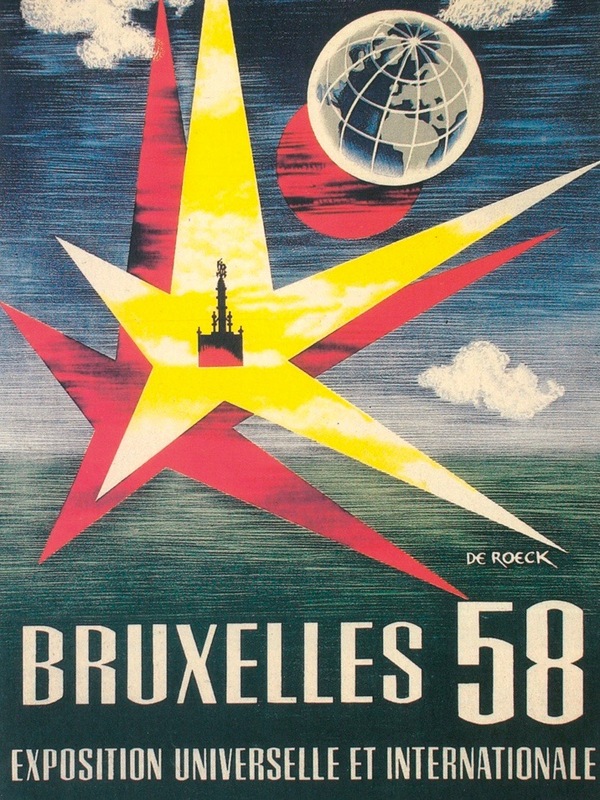 The classic promotional poster for the trend-setting Brussels '58 World Fair. File photo. The front view of Prague's Hotel International, fully showing off the building's characteristic 1950s' "Socialist-Realist" style. Many people hate the building, but it's one of my favorites and easily visible from my apartment window. Photo by Mark Baker. Another prominent department store in Prague's downtown area, the Družba, evokes a similar 1970s-era, "Brutalist" aesthetic. File photo.